Jeremiah is a dog (golden retriever, 65 pounds), reddish-gold with blue vest, imprinted with THERAPY DOG on the top side. Jeremiah is used to reduce fear and anxiety and increase pain tolerance in pediatric patients. Jeremiah is safe and effective for children of all ages. For maximum efficacy, Jeremiah should be applied at the first signs of patient stress or discomfort. Visits of five to ten minutes are generally sufficient for immediate reduction of symptoms; however, Jeremiah can safely be applied for periods of up to several hours. There is no limit to the number of cuddles, hugs, or kisses per visit. Jeremiah may be administered daily or more frequently as necessary to control symptoms. Side effects may include smiles, laughter, and prolonged bouts of giggling. Cessation of tears and increased cooperation may also be noticed. It is not possible to overdose on this treatment. However, many patients do find Jeremiah addictive and may wish to return for follow-up visits, even in the absence of the original complaint. Jeremiah was raised and trained by Hero Dogs to become a service dog for a veteran with a disability, but his temperament and skills really suited another career better – Jeremiah is a facility dog working with the Child Life Specialists at INOVA Loudoun Hospital. Jeremiah officially graduated from his Hero Dogs training in November 2017. Since beginning work at the hospital in May, Jeremiah has quickly become one of its most popular employees. Jeremiah loves snuggling with patients, showing off his skills, and amusing patients and hospital staff by popping bubbles and giving high fives. Jeremiah is already a hero to hundreds of children and their parents in the Washington area. Jeremiah underwent the same rigorous training and socialization as all of Hero Dogs’ service dogs – and like our service dogs, he was provided to the hospital at no charge. Yet the cost to Hero Dogs for each of our service and facility dog placements is $39,500. We are supported entirely by donations from you. 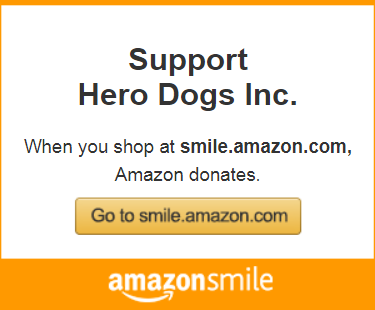 Please make a donation TODAY to support the important work of Hero Dogs. Your generosity fills the prescription for better health and happiness for veterans, heroes, and their families. All donations to Hero Dogs support the raising, training, and placement of service dogs and other skilled canines like Jeremiah. Always looking for ways to make the hospital a more pleasant experience for its patients, the Inova Loudoun Hospital staff recently added a four-legged team member to do just that. Two-year-old golden retriever Jeremiah walks into the hospital building with authority. Donning his blue vest and ID badge—the same worn by any hospital employee—his gait lightens a bit as his handler leads him into the pediatric emergency room. He knows it’s time to work. Once inside a patient room, Jeremiah, with permission first, jumps onto the hospital bed next to a patient. He may lay his head next to the young boy or girl, or offer some compassionate encouragement when the child needs to prepare for a procedure, like putting in or taking out an IV. He also knows how to delight with his many tricks, perhaps the most adorable of which is his ability to pop blown bubbles on command. Dr. Jill McCabe, medical director of Inova Loudoun’s children’s emergency department, put the wheels in motion for the addition of a facility dog to the hospital. “I was aware of comfort dogs working with people in other environments, and I thought it would be great for patients if we had a dog to work with them,” she said. McCabe turned to her friend, who sits on the board of Hero Dogs Inc., a nonprofit organization that trains service dogs to assist veterans with a wide range of disabilities, including PTSD and anxiety. “They have an occasional dog that doesn’t completely complete training, so they put them up for facility dogs. They reached out to us and asked if we would be interested. [Child Life Specialist] Allyson [Halverson] and I met a few of the dogs, and Jeremiah was just the perfect fit for us,” McCabe said. Jeremiah didn’t make the cut for a full-fledged service dog because of his “outgoing” personality,” she said. He also is a little fearful of thunder. But at the hospital, Jeremiah doesn’t flinch when it comes to medical equipment, alarms, or a screaming or crying child. He is completely at ease around new people, and has even won over some young ones who fear dogs. He came to the hospital already well trained, having been with Hero Dogs since he was 8 weeks old, and knowing 50 commands. Jeremiah will officially graduate as a facility dog in November, but has been at the hospital now for a few months and has quickly become perhaps the most popular staff member. He works alongside the hospital’s two child life specialists, Halverson and Kim Van Etten. McCabe brings Jeremiah home every night to the delight of her family. The addition of Jeremiah to the Inova Loudoun Hospital team earns the hospital yet another accolade, being the first in the Washington, DC, area to use a facility dog. It’s been an important addition to the child life specialist team, both Halverson and Van Etten said, and has often made them question how they did their job before Jeremiah walked through the door. The child life specialists’ main role at the hospital is to make it as comfortable a place for children as possible. They work in the pediatric ER as well as the pediatric inpatient unit. “He’s just a miracle worker,” Halverson said of her new four-legged friend. “Even when child life specialist’s tricks don’t work, Jeremiah works,” Van Etten added. Already, the stories of Jeremiah’s impact at the hospital are countless. He’s been especially effective with Inova Loudoun’s special needs patients. “We had one young adult in the hospital with special needs; he was nonverbal, can’t see. … We would take Jeremiah to see him, and just putting his hand on him his whole face brightened,” McCabe said. “His mom said it’s the only thing that made him smile,” Van Etten said. Jeremiah is at the hospital about 40 hours a week working with the child life specialist team. The staff has adopted thorough infection control and sanitary procedures to ensure Jeremiah’s presence is anything but disruptive. Some rooms in the pediatric ER and inpatient unit are kept “dog free” for patients with allergies. When Jeremiah enters a room, patients and family members are asked to put on hand sanitizer. New sheets are placed on the bed for Jeremiah to lay on, and hands are cleaned again when Jeremiah leaves. The child life team has also been trained on types of patients he may not be able to see, if a certain type of infection is present. Jeremiah’s popularity has other members of the hospital staff eager to add a facility dog to their teams. The outpatient rehab team is particularly anxious, as Jeremiah has made some visits and made some inroads with patients recovering from surgery. Other hospitals in the area are also taking notice, Halverson said. “We’d love to expand it out to anyone,” she said. Gina Harrison, nurse manager of the children’s ER, credits the child life specialist team with the tremendous job they have done integrating Jeremiah into the everyday flow of the hospital. The public is invited to meet Jeremiah this Saturday, Aug. 19, during a special movie night at the Lansdowne campus. The movie “Up” will begin playing at 8 p.m., but pre-movie activities start at 6:30 p.m. The free event includes glitter tattoo and balloon artists, games and crafts, photo booth, treasure hunt and giveaways, a “sneak peek” of future patient rooms, and tours of the Inova Children’s Hospital ambulance. Children are invited to bring their favorite stuffed toy to the teddy bear clinic in the Inova Loudoun Mobile Health Services bus. Popcorn and snow cones will also be available, and more food is available for purchase by participating food trucks. The public is asked to come early to secure a good seat for the movie on the hospital’s south lawn, and picnics are encouraged. For more details about the event, go to inova.org/LoudounMovieNight. Click here to read Jeremiah’s full blog.